I love decorating my table for the holidays, and it’s one of my favorite parts of my home when it’s all gussied up for Christmas. I’m not a fancy girl, but I love having a pretty table, and I want it to be both simple and beautiful. This year for my Simple Farmhouse Christmas Tablescape, I used classic white dishes, burlap-wrapped trees, galvanized lanterns, a pop of red with cranberry trees, and a red grain stripe table runner. My favorite part? New dining room chairs that I adore, and the most darling mini boxwood wreaths tied on with red gingham ribbon. Best of all, I put it together in less than 15 minutes. Come on in and take a look! I am so please with how everything turned out, and the fact that I was able to do it pretty quickly was even better! This post is sponsored by Better Homes & Gardens at Walmart. As always, all opinions are 100% mine! I am IN LOVE with my new dining room chairs. I did have benches on either side of my table, but I’ve always loved the look of chairs on one side and a bench on the other side, and it’s perfect. I adore the cross on the back, and that they’re distressed. These are called distressed white, but they are definitely more of a cream color. They also come in galvanized metal, which are super cute too. I tied mini boxwood wreaths on to the back of the chairs with red gingham ribbon, and they pull the whole look together. On the table itself, I started with a red grain stripe runner, then added three burlap-wrapped trees that I frosted (super easy–tutorial coming soon) for a vintage look, and three cranberry trees to tie in the red from the gingham ribbon. I staggered them in the center of the table, then put a galvanized lantern on either end. They are less than $10 right now, so if you love them like I do, now is the time to grab them up! I love them because they’re so versatile–I use them all year round, and they’re perfect as part of my Christmas tablescape. I love white dishes best. I love that they’re classic and simple, and the epitome of farmhouse style. I have round white dishes on the bottom, and the salad plate on top is scalloped around the edges, adding that extra bit of charm. 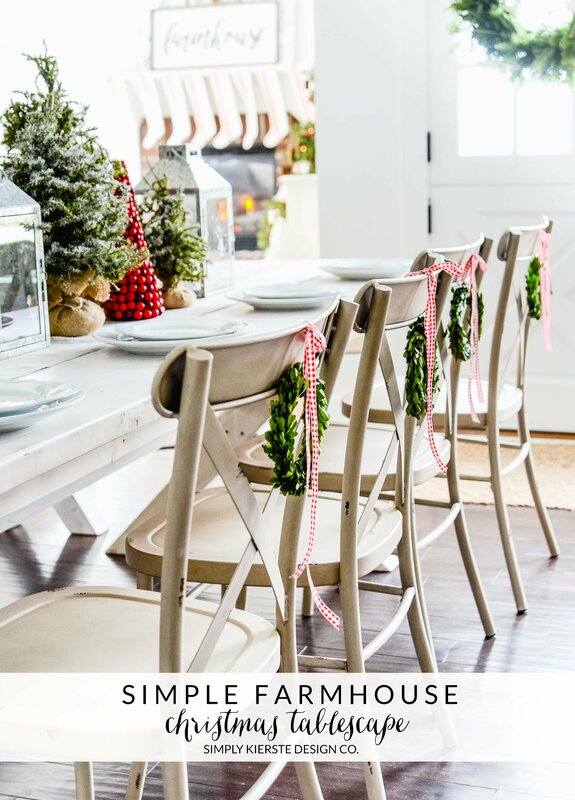 Simple, quick, and full of Christmas…this Christmas Tablescape is full of farmhouse charm! Gah!! Love your chairs with the mini wreaths. We love ours, I think they look fantastic in your space. So simple and so stunning, Kierste! 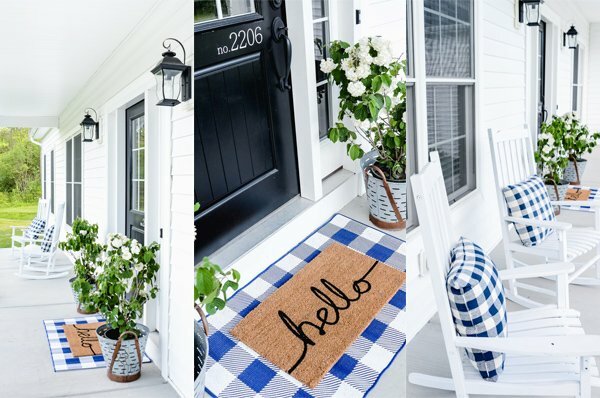 Love the farmhouse charm! I just LOVE seeing all your creativity all year round!. It’s been a while since I popped in to say HI but I am always here relishing in your talents. I wanted to wish you and your beautiful family a Very Merry Christmas and Happiest of New Years! It looks like you have settled into a little piece of heaven in your new home. Thank you for bringing a little piece of that heaven to me throughout the year. What are the wreath made out of are the real greens and if they are what kind? Hi, Dorelle! I bought those many years ago, and I don’t remember where they came from. I’m so sorry!